I just ran downstairs to go see the national anthems played for the Slovenia- USA match. Very touching, the camera panning over the faces of the players while the music plays. I loved the US fans holding up the pics of Lincoln and Washington, and the two dressed up as Elvis. Can’t get more American than that, right? LOL! The weather is still cool in Seattle even though summer solstice is at hand. This morning I have to run out to a sale at Nordstrom’s and see if I can pickup one or two more short sleeve shirts. 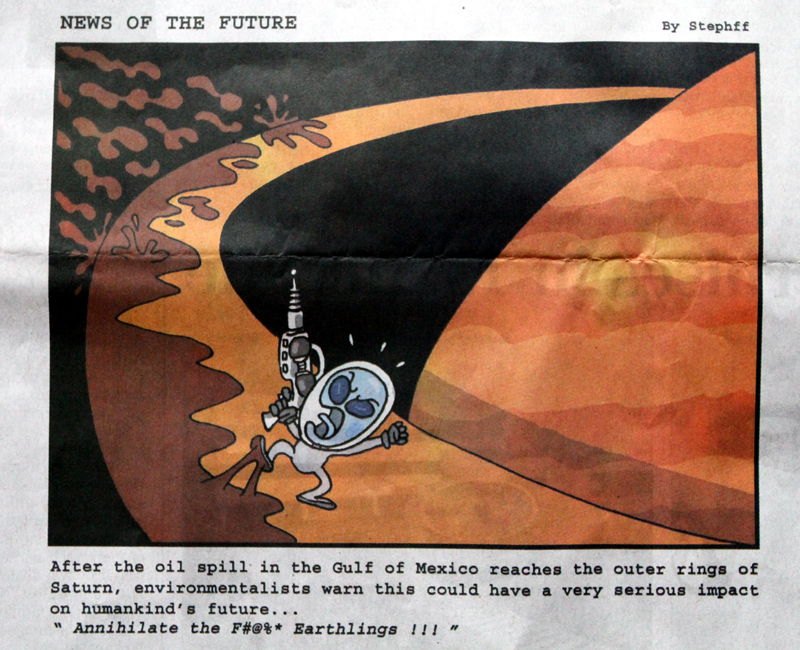 And here is a cartoon of the oil spill – reaching the outer rings of Saturn. Ouch. It makes me flinch every time I read or hear about it. Yes, it’s still Thursday in Seattle. 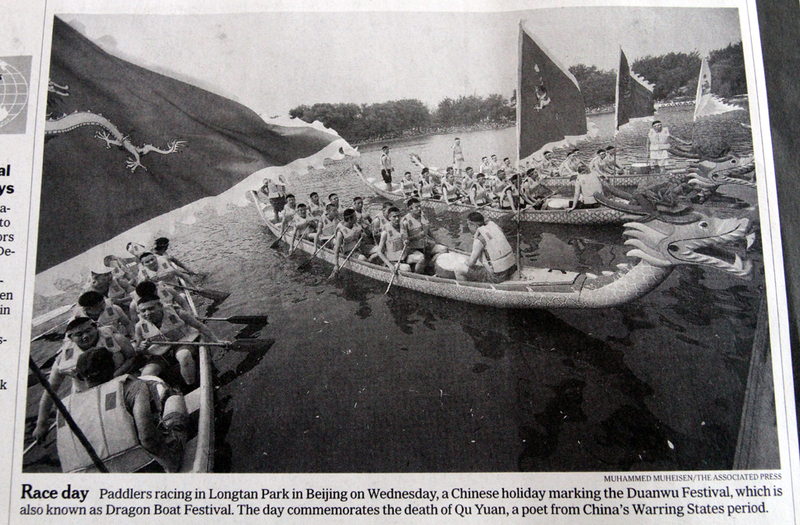 I’m posting two belated pictures from the Dragon Boat Festival taken from newspapers at Hong Jong airport, since I could not be there in person. (Click on them to make them bigger). 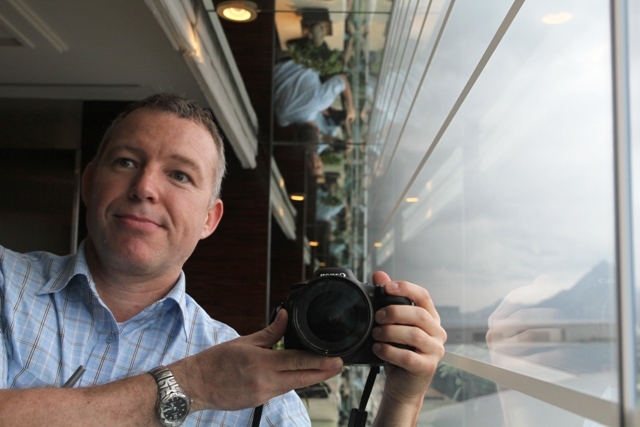 The first one is from a small bay on Lantau Island (site of Hong Kong airport). The next one is from Longtan Park in Beijing. The ritual claims to pacify wandering ghosts and bring prosperity to residents. 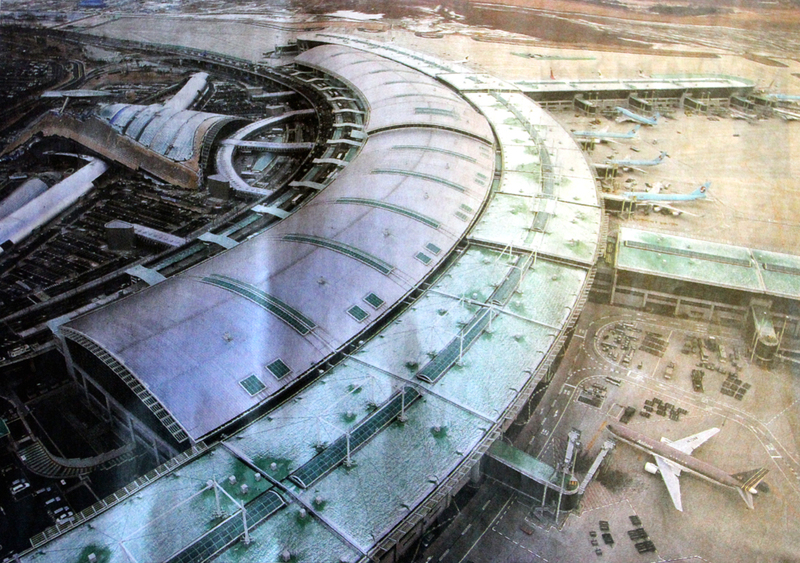 The Asiana Airlines bird sitting on the tarmac brought us to Seoul; the next picture is again from a newspaper, showing the Incheon (Seoul) airport building’s current crescent shape; expansion plans are already in the works. My flights went without incident or delays, and the food was top notch. Next to me sat a 19 yo Korean student coming to Seattle. She must have well-to-do parents, flying business class! Sometimes the nice thing about getting on a long international flight is that one is out of reach : no Blackberry. So no e-mail, no phone calls, no text messages. Yes ! 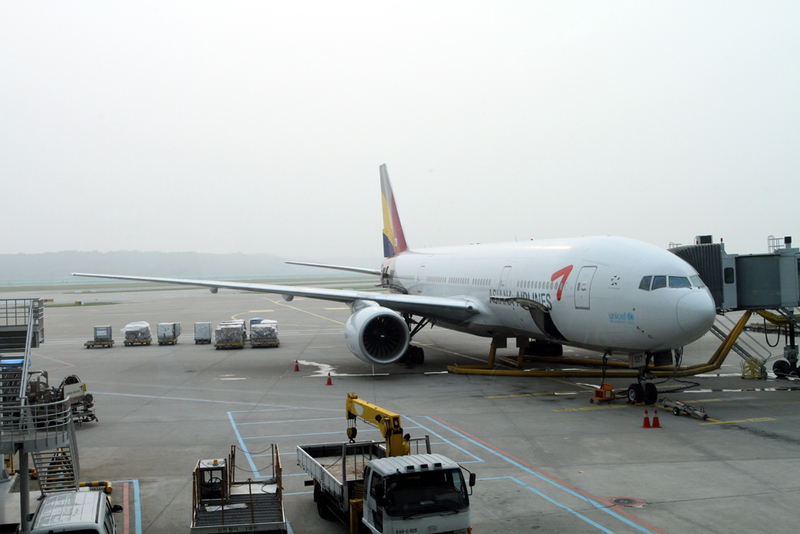 I’m flying back the way I came : Hong Kong to Seoul, Seoul to Seattle. 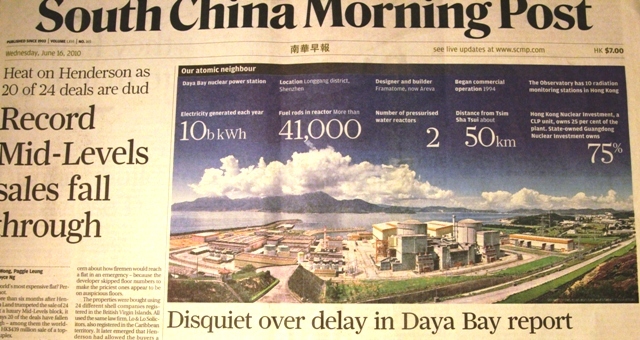 This article in yesterday’s newspaper says there was an ‘insignificant’ increase in radiation at the Daya Bay nuclear plant probably caused by an improperly sealed fuel rod in one of the reactors. There are more than 41,000 fuel rods in the two pressurized water reactors. 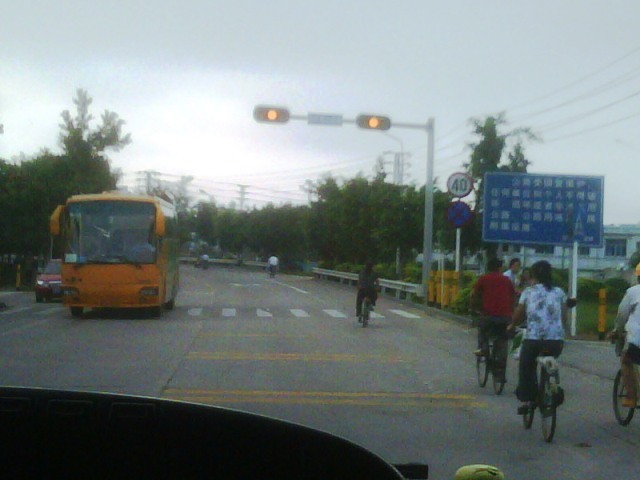 The incident happened on May 23 (so I was not there at the time). The reactor is only 50 km from Hong Kong and critics are saying that the incident should have been reported immediately. Picture is from the Marriott Skycity Hotel, in the elevator lobby on the 8th floor. Wednesday/ work one more day ..
.. and then right back to Hong Kong for my trip home on Thursday. Did I have to come to work for one day? Yes, a lot is happening and I have to hand over to some team members that arrived back on site. 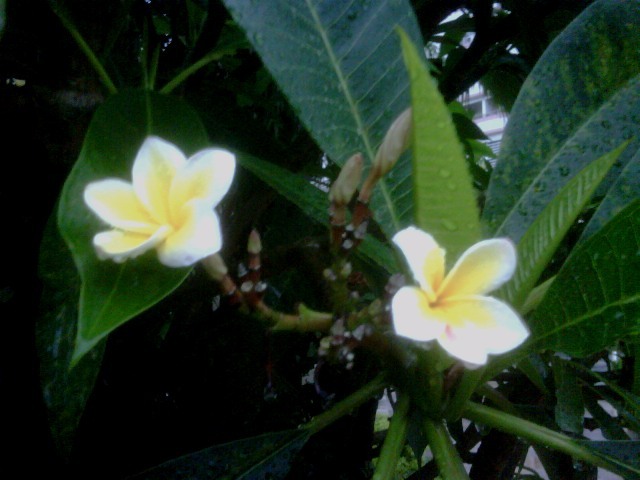 It is summer, and the humidity is everywhere. Someone left the men’s washroom door open here in the building and the mirror is full of condensate. The marble floor is damp in places. Riding the tram is fun, but offers no getting out of the steamy heat. My camera lens fogs up immediately when I take it out, but then it warms up and it is OK. That’s Two IFC (International Finance Center) in the background with the tapered top. 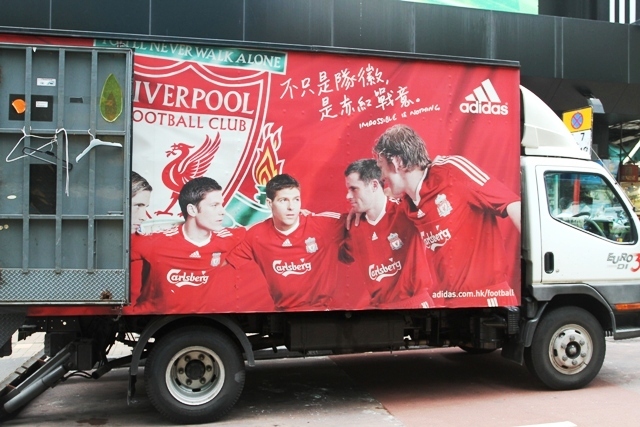 This truck with the Liverpool soccer team on was in front of the Adidas store in Kowloon. ‘You’ll never walk alone’ it says in green .. meaning – you’d always have some buds in the pub and something to talk about? Inside the store they had only a few of the World Cup t-shirts in my size, so I didn’t buy any. 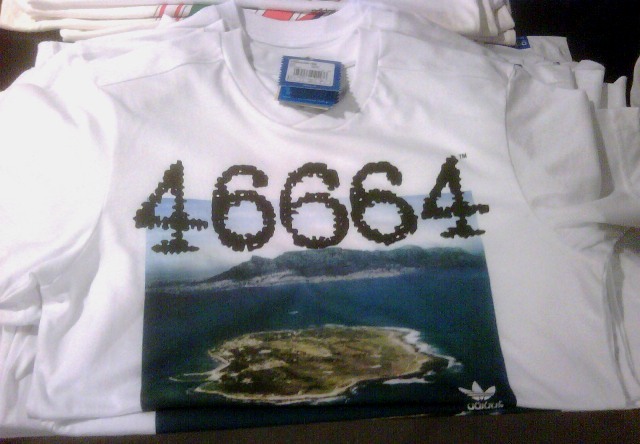 But check out this very political t-shirt they also sell : Robben Island (with Cape Town in the background) where Nelson Mandela was imprisoned. 46664 was his prisoner number. 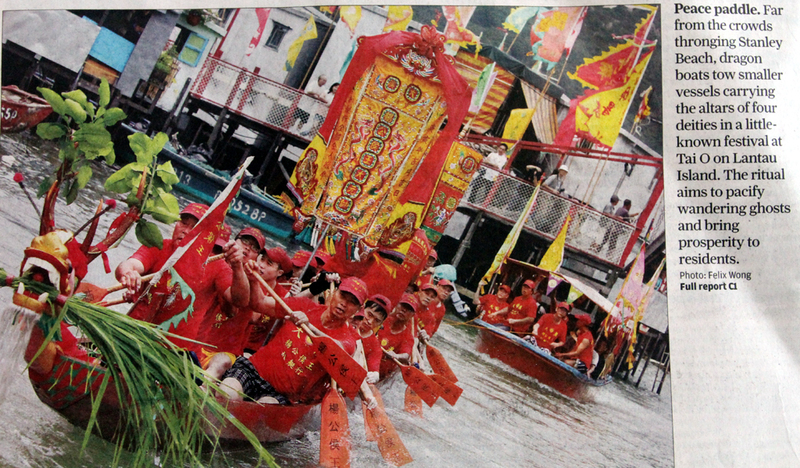 The dragon-boat races are only tomorrow, and I have to go to work tomorrow so I will miss it. Aargh. But here are some pictures from yesterday. It’s very warm and very humid, so the shopping malls and the subway is a welcome respite from that! Nike bill-board that says you will be an immortal if you score a World Cup goal. Can you make the numbers on the defenders’ backs go to zero? Scroll down for the answer. 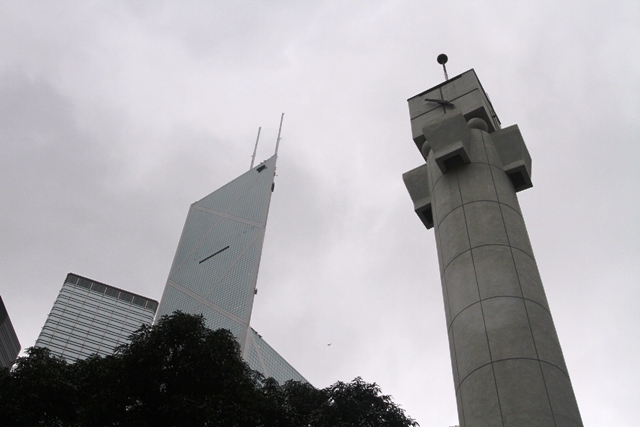 Clock tower built in 1991 for Hong Kong Park near the base of the Bank of China building. Check out the vanishing edge that ‘cuts’ the air. I guess that’s what makes the feng shui critics hate the building. I love it, so I guess I’m a feng shui barbarian. 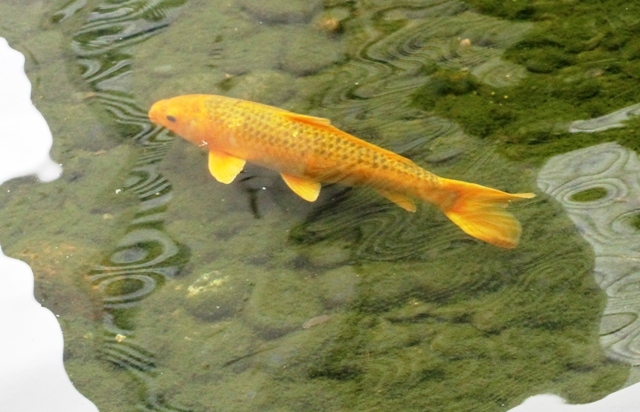 The next pictures show the man-made pond in the park, and a koi. I want to be a lazy koi in my next life. 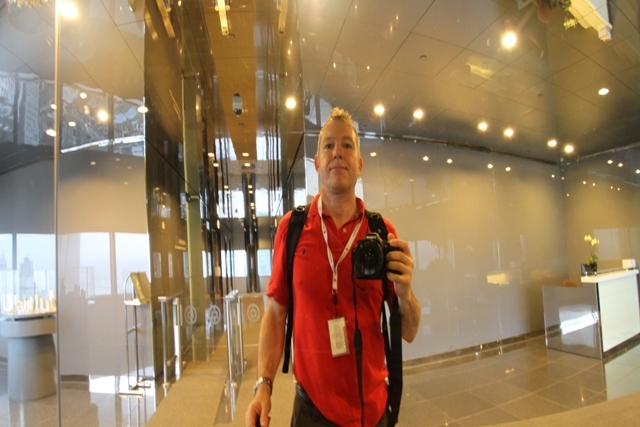 Next picture shows me in the small lobby on the 43rd floor of the Bank of China building. The 70th floor deck at the top is accessible only by appointment. 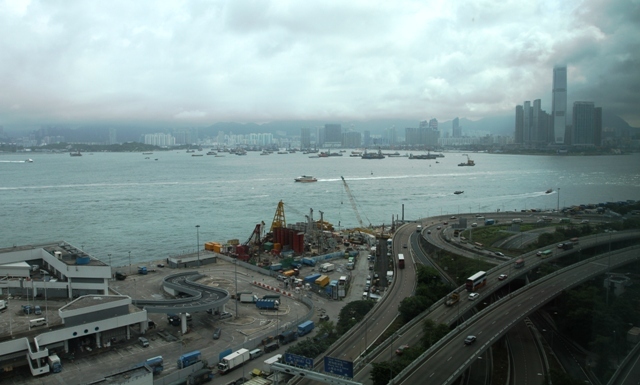 The next picture is the view, looking down on the area by the Star ferry terminal that runs north to Kowloon; lots of construction going on there. 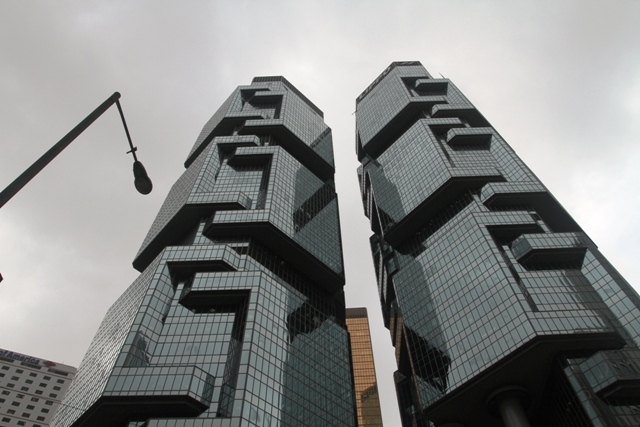 Is this building – it’s called the Lippo Center – ugly or beautiful? You decide. 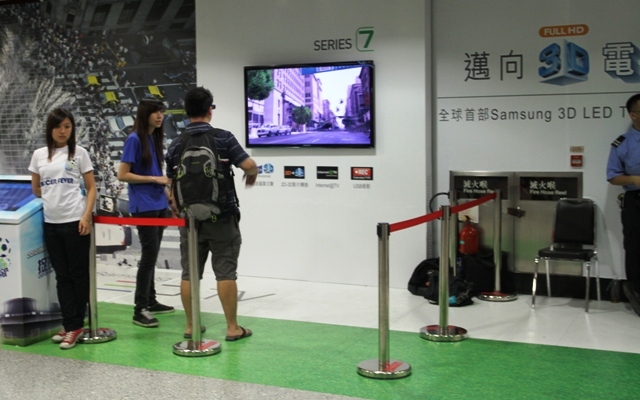 Samsung has demonstration stations in the subway for their new 3D LED TV. I didn’t get to take a look, though. 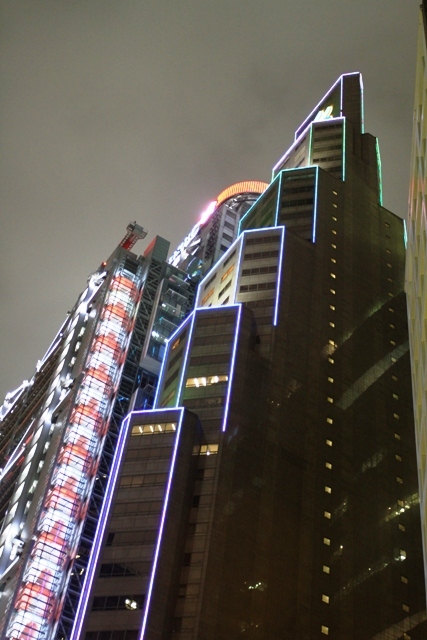 This neon-lined building is close to Central Station; I don’t know the name. 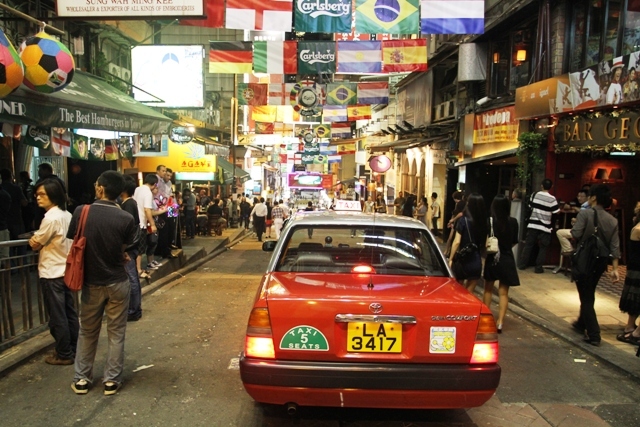 And the ubiquitous red Hong Kong taxi is in the bar and restaurant area a little more up the hillside also close in the Central district. This is where all the expats come and party. The World Soccer Cup is an extra incentive – as if they needed one ! See all the flags? – but no South African flag, so boo for you Carlsberg! Watch it, I will stop drinking your beer. Answer : 11 18 9 7 3 goes to 7 9 2 4 which goes to 2 7 2 which goes to 5 5 .. which goes to ZERO ! 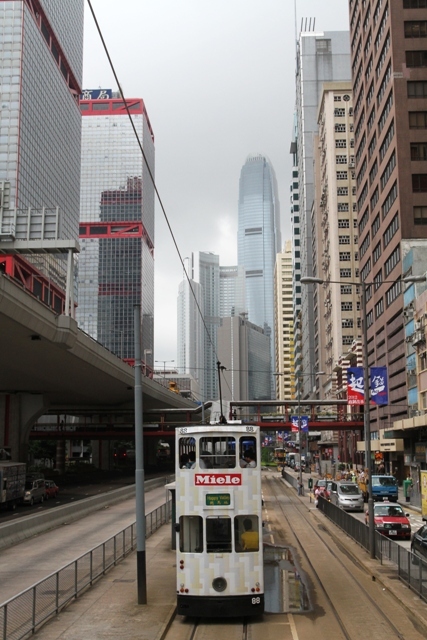 I took the coach bus from the Sheraton Dameisha to Hong Kong last night. 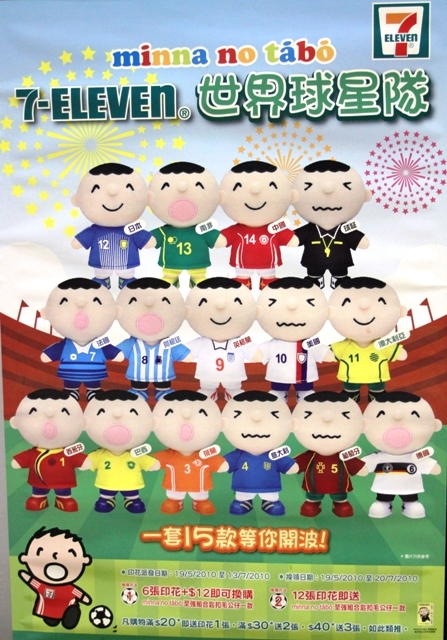 The 7-11 poster picture is for little 2010 World Cup key chain guys. Very cute. No 11 is South Africa, but that’s about all I know. I couldn’t get an overview of the teams’ shirt colors on the FIFA website. And do they change into different colors if they play another team with a similar shirt color? I think they do! 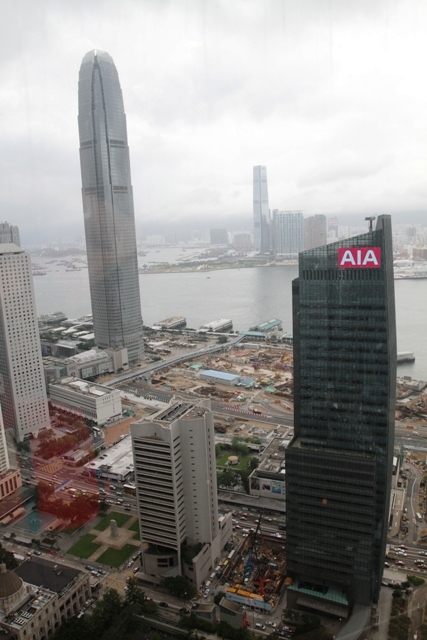 Below is this morning’s view of Hong Kong harbor from the Marriott Courtyard on the 19th floor where I stay. 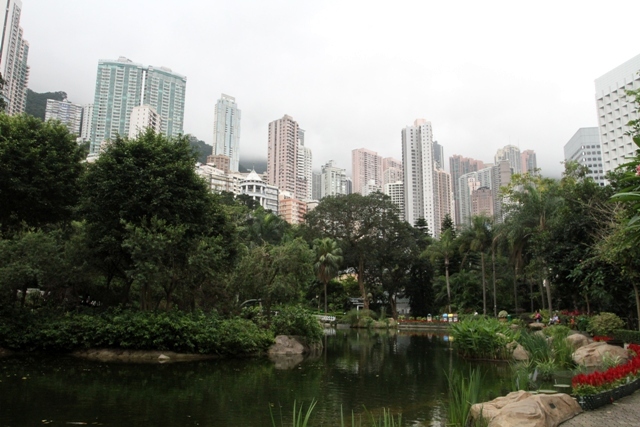 I am on Hong Kong Island looking north to Kowloon. And if I may, can I make you jealous of my breakfast? 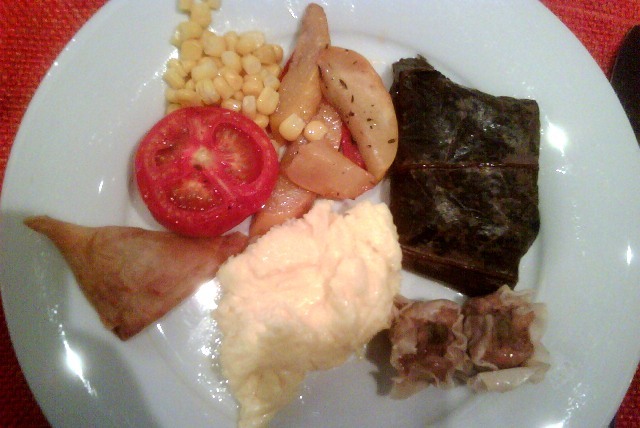 That’s a samoosa (a potato-stuffed pastry, I am using the South African spelling where they are also popular), a fried tomato, corn, yellow zucchini, scrambled egg, two pork dim sum and the Hong Kong version of a zongzi. The Duanwu Festival (Chinese: 端午節), also known as Dragon Boat Festival, is a traditional and statutory holiday associated with Chinese and other east/southeast Asian societies. It is a public holiday in Taiwan, where it is known by the Mandarin name Duānwǔ Jié, as well as in Hong Kong and Macau, where it is known by the Cantonese name Tuen Ng Jit. 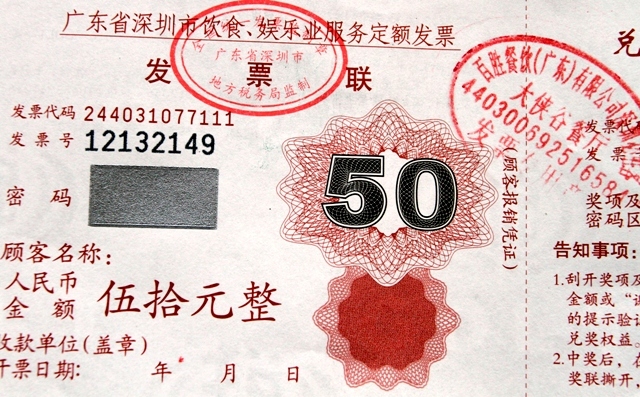 In 2008, the festival was restored in China as an official national holiday. Three of the most widespread activities for Duanwu Festival are eating (and preparing) zongzi, drinking realgar wine, and racing dragon boats. 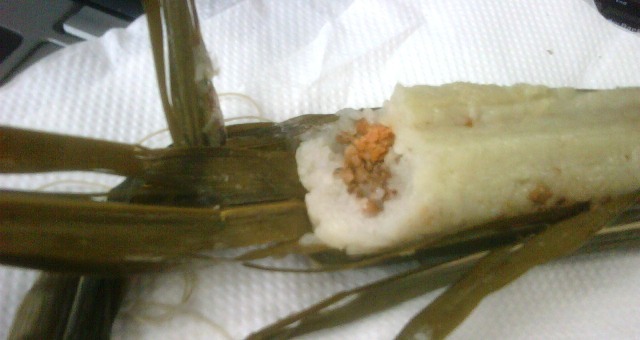 A zongzi is a glutinous rice dumpling in bamboo leaf with a meaty filling. Below is the one I got at work here. The wrapping can also be triangular. I am headed to Hong Kong tonight for the Chinese holidays which are Mon and Tue (our weekend got shifted to synch up with the local schedule). 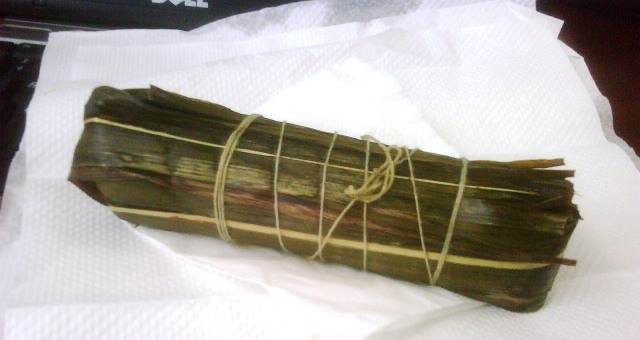 So I will go look for more zongzi , and see if there is any Dragon Boat racing to check out as well ! 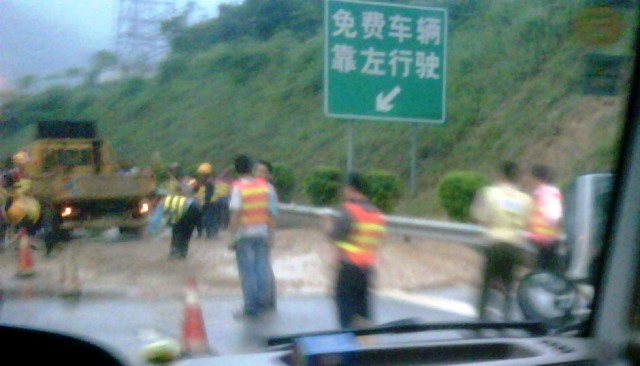 It rained on and off the last few days and last night we ran into a minor mudslide across the road just outside Dameisha which delayed us by 20 mins or so. I did not go to Shenzhen with the soccer revelers, but I did follow the South Africa- Mexico match cast for awhile on fifa.com (minute-by-minute text updates of the match, a poor substitute for TV, but better than nothing at all). The result was a 1-1 draw. And here is my 2010 World Cup draw sheet entry for our friendly competition at work. Brazil and Spain in the final, I say. In retrospect the scores I predicted are too high : not likely that 6 goals will be scored in the final ! Oh well. (Click on the draw sheet to display it clearly). 2. Do you see a Google in the picture on Google’s China home page? Very subtle. 3. And where am I? Well, the next phase of our project kicked off this week, so I am at work and WORKING on it : this weekend as well. Aww :(. 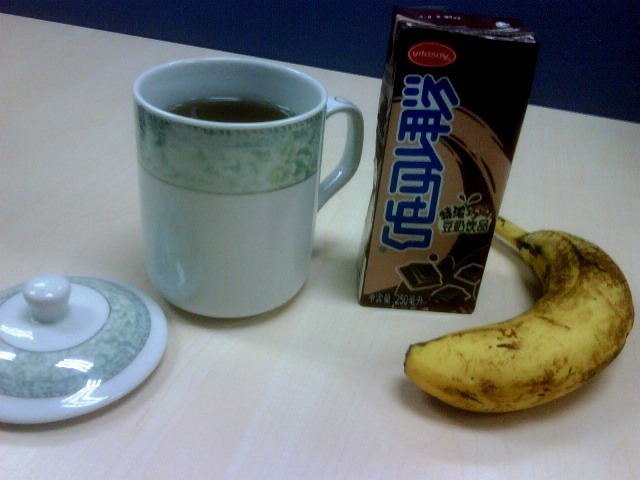 That’s black Ceylon tea in the cup (still my favorite type of tea), chocolate soy milk and a local China banana. 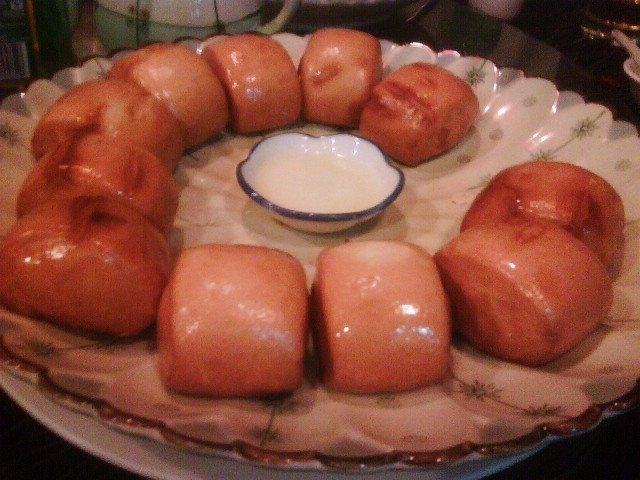 Picture from Wed night : mantou or Chinese steamed buns which we had for dessert. These have a glaze on – they can also come in just plain white. I posted a picture of them before, remember? .. I was not quick enough to take a picture before one had been nabbed already! and the sweet dipping sauce was not enough so they brought us more. Picture from Thu morning waiting for the bus : nice flowers on a shrub that looks a little like a South African katjiepiering; I should have leaned in and smelled it to tell if it was – and I didn’t. Picture from Thu morning at work : Yes! that’s a California navel orange. 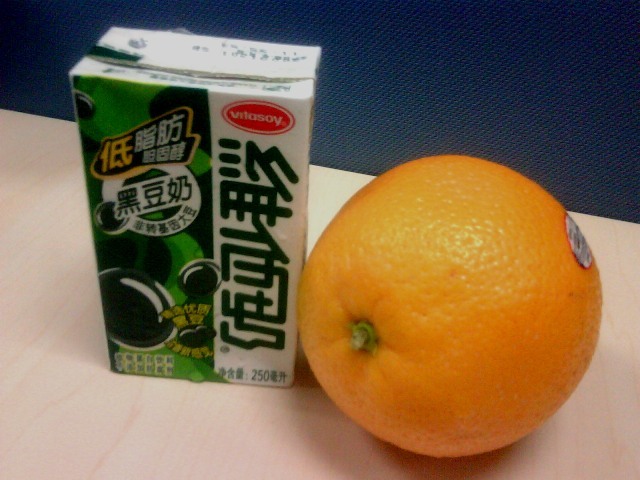 I know I shouldn’t buy California oranges in China but I need my Vitamin C, see? And the black bean-flavored soy milk next to it is NOT as delicious as it looks! I will stick to chocolate-flavored soy milk next time. Wednesday/ get out your vuvuzela! [Acknowledgment – picture as well as some text from Wikipedia]. No, not your uvula, your vuvuzela! 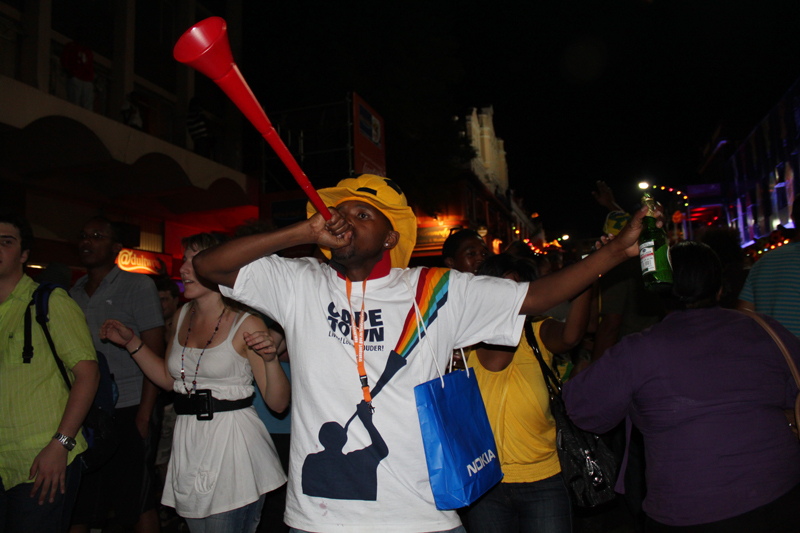 Sometimes called a lepatata (its Setswana name) or a stadium horn, it is a blowing horn appr. one metre (3 ft) in length, commonly blown by fans at soccer matches in South Africa. It requires some lip and lung strength to blow and emits a very LOUD monotone like a foghorn or an elephant. Vuvuzelas have been controversial and can be distracting to players and coaches, and may also damage hearing. Ouch. Better bring ear plugs to that soccer match you are attending, as well! P.S. I am back at work. I put my emergency packet of Sudafed I brought from the States to work. I have a bad head cold that kept me from sleeping last night and so I had to call in sick today. 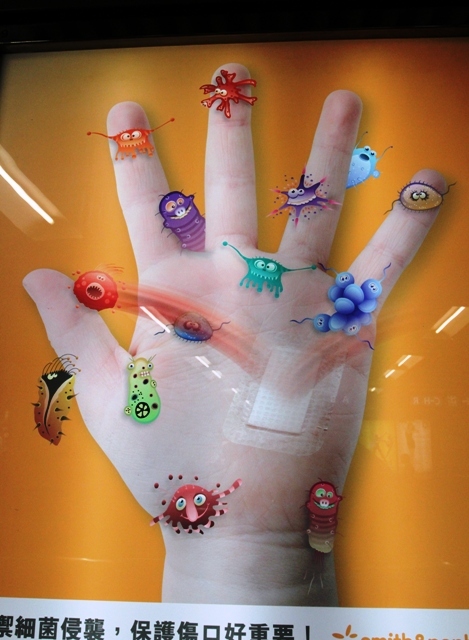 (Poster picture from Hong Kong subway .. but I am very sure real germs do NOT look as cute as these!). I thought I did so well this past weekend to just to rest up and catch up with sleep, but I guess it was too little, too late. Then again maybe I did everything right and just caught one of these nasties from somewhere. The apple vinegar did not sit well with my digestive system and I had to take the late bus to catch a few extra winks! Here is what the Monday morning at the bus stop looked like at 7.45am .. very Seattle-like, the skies. But the sun came out a little later and burned off the fogginess. They dug up the ‘trees’ lining the street here. They were actually tree stumps with thin branches and leaves. 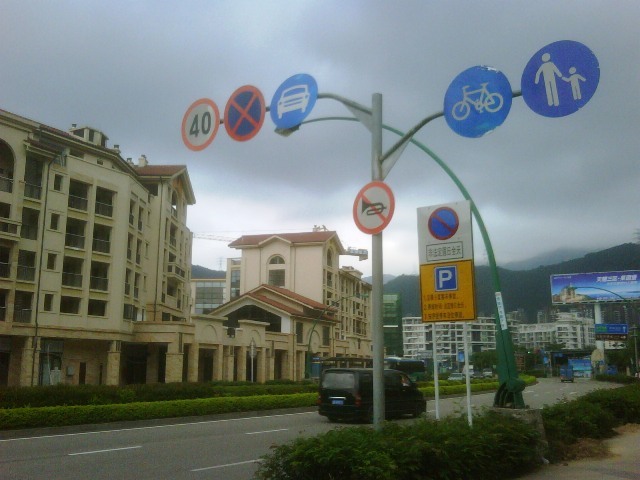 Someone on the Dameisha Municipality or City Council must not have liked the trees. More walking around Dameisha today; cleaned my apartment, and got some work done as well. 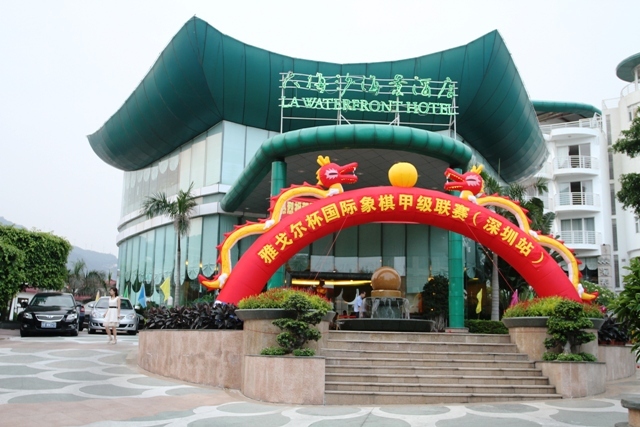 I saw that the LA* Waterfront hotel is sporting the same dragon arch than the ones I saw at the beach yesterday. It could be because of the upcoming Dragon Boat Festival .. I will post something about that soon. *Really not sure if it’s LA as in Los Angeles, California. 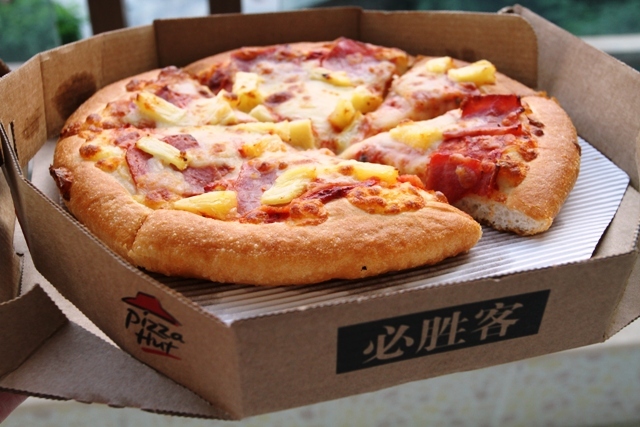 The Hawaiian pizza is from the Pizzahut in the entertainment complex Outside Chinatown here in Dameisha. It tasted OK, but the toppings are a little skimpy – not? And the apple ‘juice’ burned my throat. Man! Can it be that sweet? 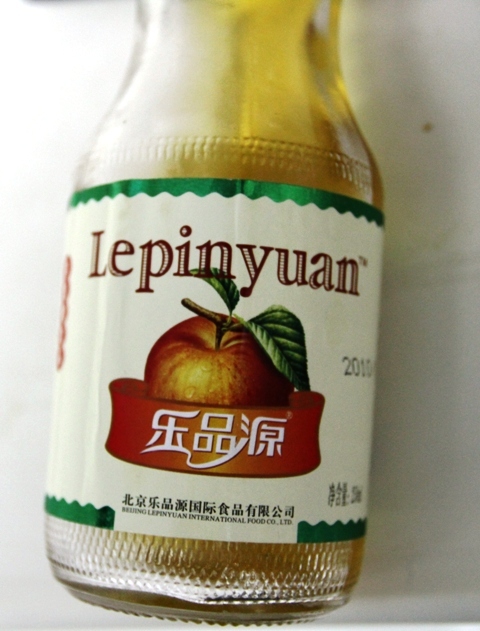 I thought – then saw on the back of the bottle it is apple vinegar, more popular here than the juice. I added an equal part of water, and then I could drink it. Finally, the paper document with the 50 on is the foreign tax receipt for the pizza. We didn’t ask for it, I suppose they gave us to us because we look – um – foreign : ). ¥50 is equal to not quite US$8, so I doubt I will pursue the payback of $1 by searching out the tax office at Hong Kong airport ! I love the geometric patterns on the note, though – and on banknotes in general. It brings back fond memories of a childhood toy called Spirograph with which one can draw graphic patterns similar to these. Dameisha is quite a happening place in summer time. The pictures are from my walk tonight. 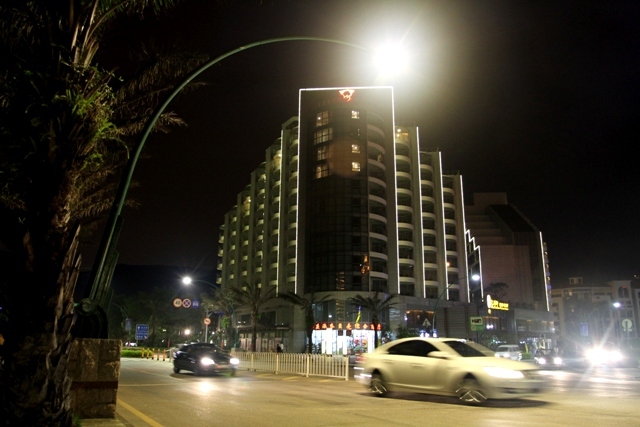 I am sure only a few of the people walking the beaches and the streets stay in the fancy King Key Palace hotel (first picture), the only hotel that can match the Sheraton Dameisha Resort hotel here. 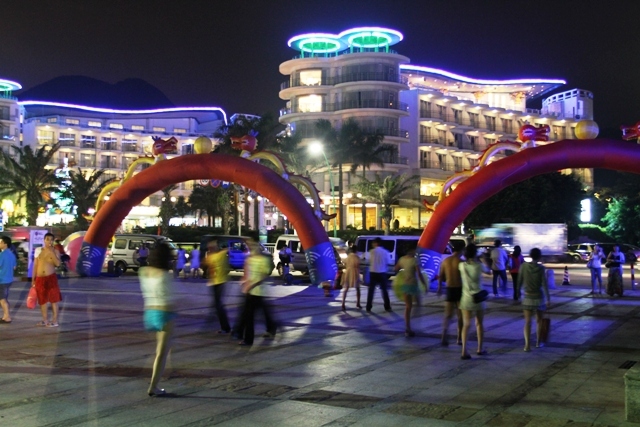 The next picture is the entrance to the main beach, the dragon arches decorating it because there is a beach volley ball tournament going on. I may go check into it tomorrow. The last picture is a few blocks from the beach. 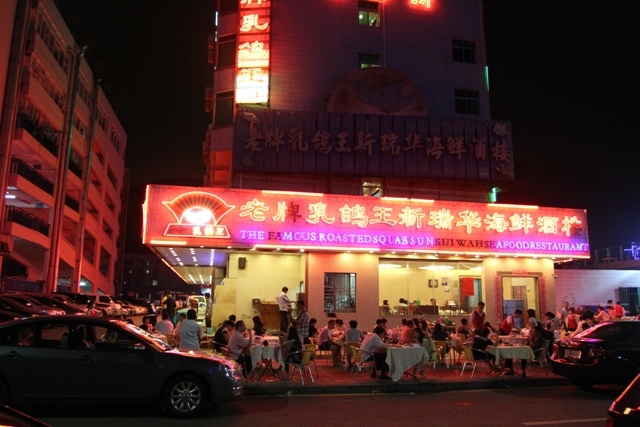 The sign says ‘The Famous Roasted Squab Sun Sui Wah Seafood Restaurant’. Hmm, not sure what to make of all that! 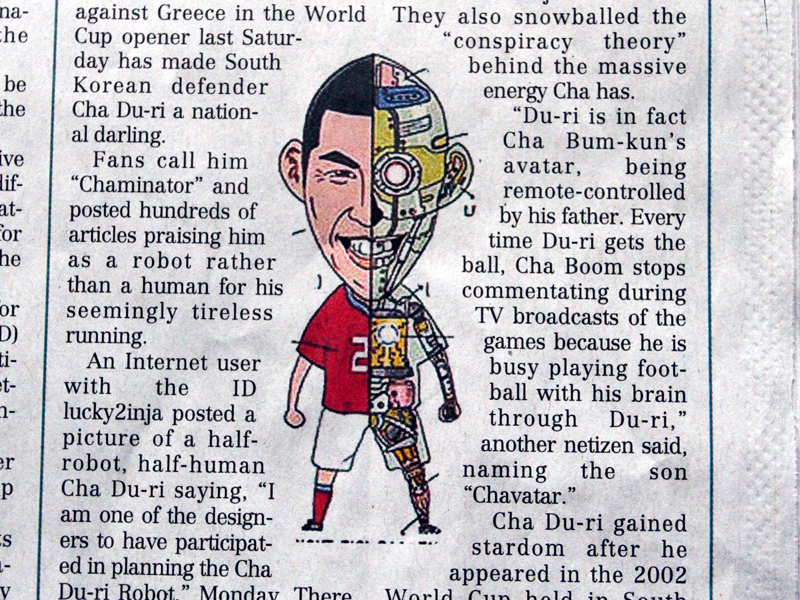 .. to the start of the 2010 World Soccer Cup, of course. 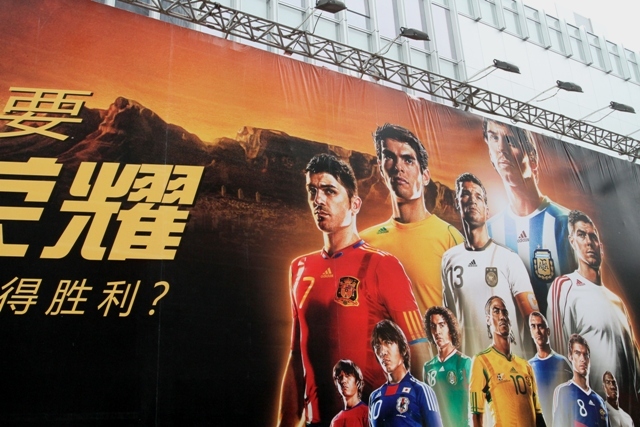 The pictures are from billboards in Nanjing Road in Shanghai. 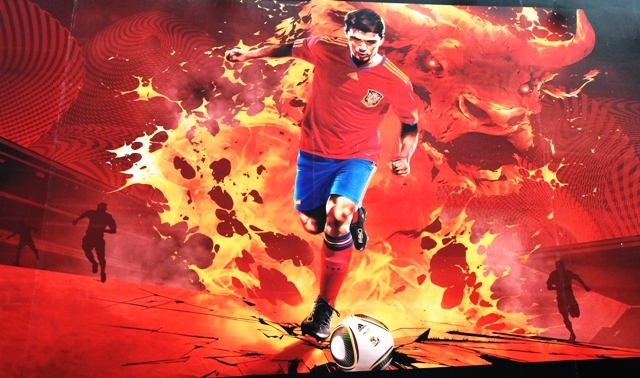 The first picture shows the fury of Spain’s team : La Furia Roja (The Red Fury). The futbolista in the picture is possibly Real Madrid forward Raul Gonzalez. The second picture has Table Mountain in Cape Town as a backdrop. It’s been a tough week at work and I am not going anywhere for the weekend. I will stay put in Dameisha. I still uncover new dishes in the cafeteria here at work. 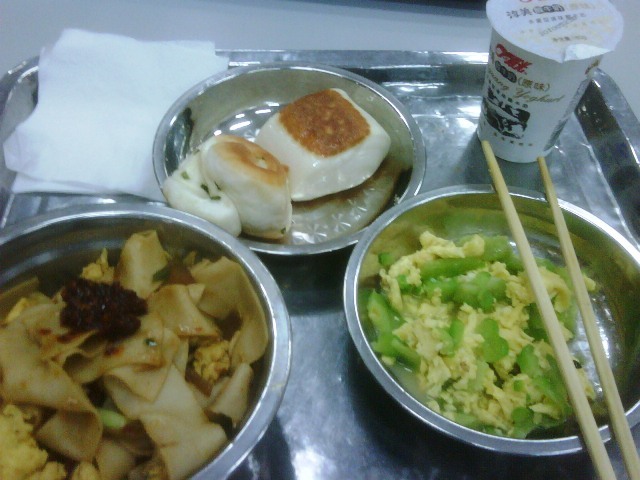 I know mantou (in bowl at top) or Chinese steamed bun/bread. It is made with milled wheat flour, water and leavening agents. The green in the scrambled egg dish is bitter melon (translated from Chinese: 苦瓜 kǔguā), a subtropical vine of the family Cucurbitaceae, widely grown for its fruit, among the most bitter of all fruits but edible. It also has medicinal properties. So bite that bitter melon! (It’s not that bitter and has a nice texture). The second picture shows the whole fruits. Here’s a cell phone picture that captured a moment in our daily commute. The light is amber but that still leaves plenty of time for everyone to get across! : car, big bus, small bus (ours) and four cyclists. The big bus is overtaking the car (probably honked a move over! at it), and the car is driving on the shoulder. Our bus is honking a On your left, watch out! at the cyclists. One would think the cyclists would go in single file, but then that is not a very social way of cycling. 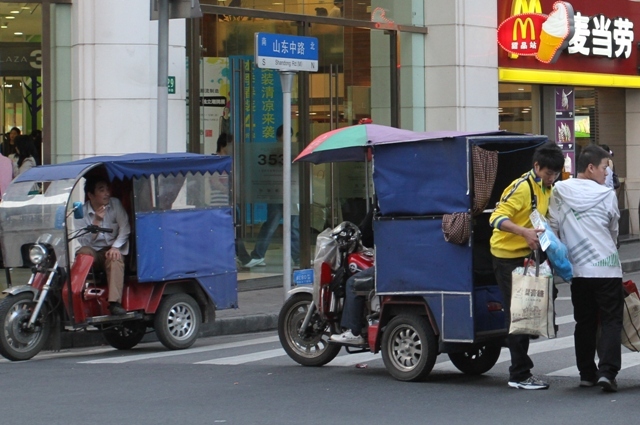 While on the subject of traffic : the bottom picture is of the type of taxi scooter in Shanghai that I took on Saturday for a short ride to the hotel. I found out that they are actually illegal. The drivers are fined but I suppose there are too many of them to make them go away completely. 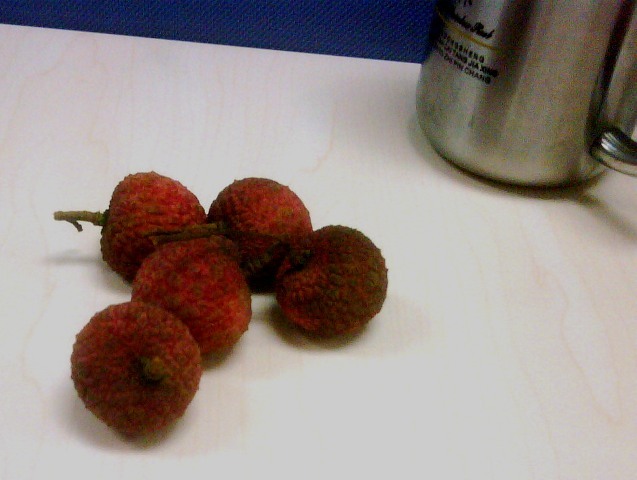 A friendly co-worker gave me some litchis; they are in season here for the next month or two. The word in Chinese has its own character. Britannica online encyclopedia : Litchis are fruit of Litchi chinensis, a tree of the family Sapindaceae, believed native to southern China and adjacent regions. 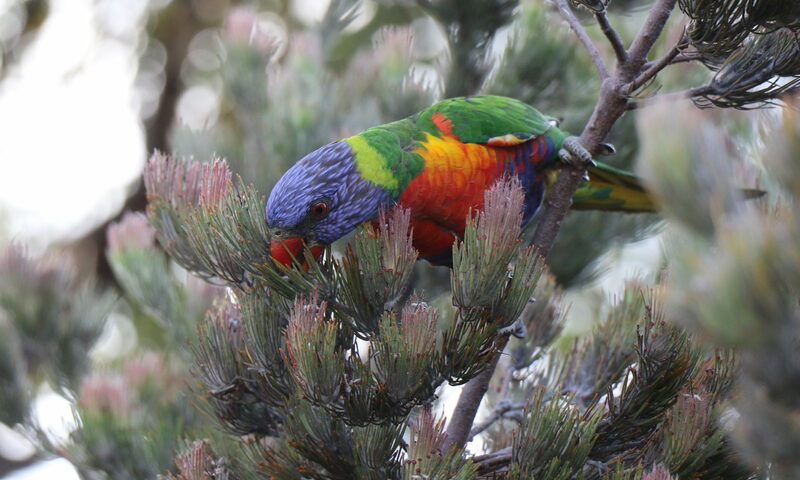 The handsome tree develops a compact crown of foliage, bright green the year round. The leaves are compound, composed of two to four pairs of elliptic to lanceolate leaflets that are 50–75 mm (2–3 inches) long. The flowers, small and inconspicuous, are borne in loose, diverse terminal clusters, or panicles, sometimes 30 cm (12 inches) in length. It’s a somber day in the USA with the remembrance of fallen soldiers in all the wars we have fought. I found the wall of flowers at the Bund Promenade in Shanghai, and I am posting the words to the folk song “Where Have All the Flowers Gone?” (1961). The first three verses were written by Pete Seeger in 1955 and the rest was added by Joe Hickerson in May 1960. No political statement intended with the song, it’s just such a beautiful sad song that also says to me that what was lost once may come back to us in another form. Young girls picked them, ev’ry one. Gone to the young men, ev’ry one. Gone for soldiers, ev’ry one. Gone to graveyards, ev’ry one. Gone to flowers, ev’ry one.